Truly one of the most famous quote in history. 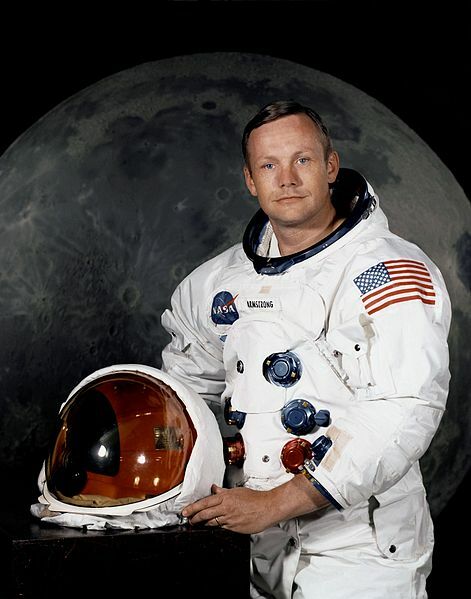 Neil Armstrong, first man on the Moon, died aged 83. As a boy, reading about the Apollo 11 mission was my first tryst with adventure. Today, I relived those early years when I read about man's first voyage to the Moon. Though I never idolized Neil, I know of plenty of friends who did and some who are scientists and astrophysicists today. Back in the 70's and early 80's, when the fight to explore space and beyond was still gaining punch, Neil was a reluctant hero and a true gentleman who held on to his values. I remember one particular news article which stated how he sued his long time barber, who sold his mane without his permission. The barber ultimately had to donate the proceeds of the sale to a charity of Neil's choice. It is quite rare a person of Armstrong's fame try hard to stay in the shadows. Neil almost never signed an autograph after realizing that his 'fans' were selling them for huge profits. While America has lost one of its finest astronauts, the world has lost a hero that has inspired millions.